After the revision of the revised criteria for which public LAUSD schools would be eligible to be outsourced to corporate management organizations, our school is pleased to learn that OUR SCHOOL WILL NOT BE ONE OF THEM! We grimly noted that both Carver MS and Jefferson HS however, are on the dreaded takeover list. We hope their staff and faculty pull together to out forth a strong plan for the benefit of all of their students. We also wonder which organization will have what it takes to turn around troubled schools such as these, since Green Dot has yet to prove it can do so at Locke HS. From the Solidaridad blog by Robert D. Skeels. Click on link below. We meet only 1 of the criteria, PI 3+ status, so we should be exempt from takeover this year. However, as we understand it, the L.A. School Board called a meeting this past week to support SB51 which will require that 5% of all struggling schools be eligible for a takeover. While we may be out of the fire this year, it is no guarantee we will remain a public school in perpetuity. Why is the School Board in such a rush to abdicate their authority? Our students and staff were quite content to receive the news that our school met and exceeded the growth target assigned to us by the state of California. We were required to grow by 10 points and we grew by 17. Almost all our subgroups met their targets with the exception of EL's and Special Needs. 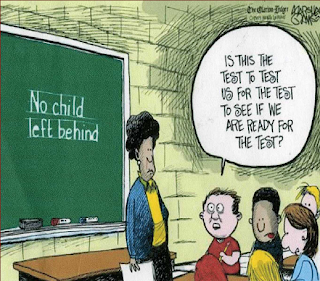 As teachers, without a doubt we believe that today's obsessive climate of testing students is not the solution to improving education. While there is a place for data, it is only a tool, and nothing else. Having said that, we are professionals, and administer all periodic assessments, common assessments, end of unit exams, pop quizzes, and the CST, as required by the CDE. We anxiously waited for our scores and were gratified to see that our unique schedule that allows us to divide our school into 9 teams of students (teachers have common conference periods) and gives all students real elective classes, resulted in increased academic performance as measured by the API. our school. Thanks to NCLB, we are deemed to be a "struggling school", even though our test scores have gone up every single year in the last 5 years. Now, thanks to the Flores-Aguilar plan, our school is up on the auction block, for anyone to bid on. Should we write a plan? Just who is we? The union? The teachers? The instructional leadership group? The arts department?